Nashville, Tenn. (April 19, 2016) - For the first time in his illustrious career spanning nearly five decades, multi-platinum selling Sammy Kershaw has finally recorded the Blues album he's been hinting at for years. The Blues Got Me (Big Hit Records/RED) features eleven tunes with strong ties and sounds to Kershaw's Louisiana roots, right up through the heartbeat of Memphis on Beale Street. "This album has been in the works for a long time and I thank God for giving me the opportunity to be able to record it and bring it to you," says Kershaw. This collection features Kershaw's take on timeless classics such as Chuck Berry's "No Money Down," the Allman Brothers' "It's Not My Cross To Bear" and the song made famous by Solomon Burke, "Where'd The Money Go." 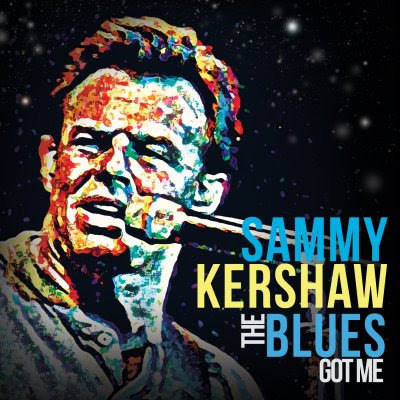 This classic Blues album, produced by Kershaw himself, also contains seven originals written and co-written by the legend such as "I'm Going Crazy," "No Money Blues," "I'm Your Huckleberry" and others. Kershaw adds, "I guess you could call it a 'Cajunie' Blues-type record. Lotta Cajun, Swamp-Pop Music and maybe a little bit of Zydeco influenced into this type of Blues. Just a fun project. Something a little different!" The Blues Got Me will be available for purchase on May 13, 2016. Pre-orders are available now at Amazon.com.